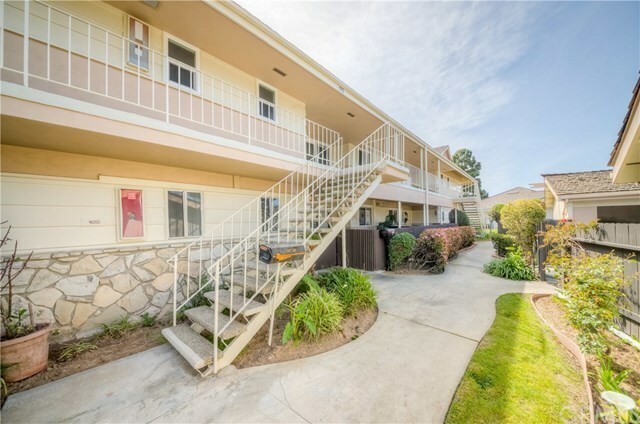 Welcome to this adorable two bedroom, two bathroom upper unit with two patios. Nestled on the top level, this unit has a great view of the golf course, in New Horizons 55+ community. New windows and large patio doors allow light to pour in. The spacious living room has updated fireplace, and the large balconies on either side lend to an open airy feeling. There are updated dual-pane windows and sliding glass patio doors. The inside laundry area in the hallway spaciously accommodates side-by-side washer/dryer. There's a shared, enclosed garage with storage with 2 parking spaces! Top units also have finished attic storage. The array of HOA amenities is fantastic, including a 9-hole golf course, putting green, tennis court, clubhouse/community center, library, billiard room, card room, swimming pools, sauna, spa, picnic and BBQ area, gym/exercise room, table tennis, woodwork shop, ceramic/artisan center and much more. Conveniently located close to fabulous dining, shopping, other leisure and recreation activities, medical facilities and transportation routes. The complex has a friendly pet policy. One resident must be 55+.